1 Comment on 3 Tips For Losing Fat ! TIP 1: CLEAR THE KITCHEN It all starts with cleaning out your kitchen. Make no mistake: If food you shouldn’t be eating lurks in your fridge, cupboards, or freezers, you will give in at some point or another. You may think you have willpower of steel, but wait until your leptin levels start dropping and hunger clouds your every waking thought, and a few of your dreams. 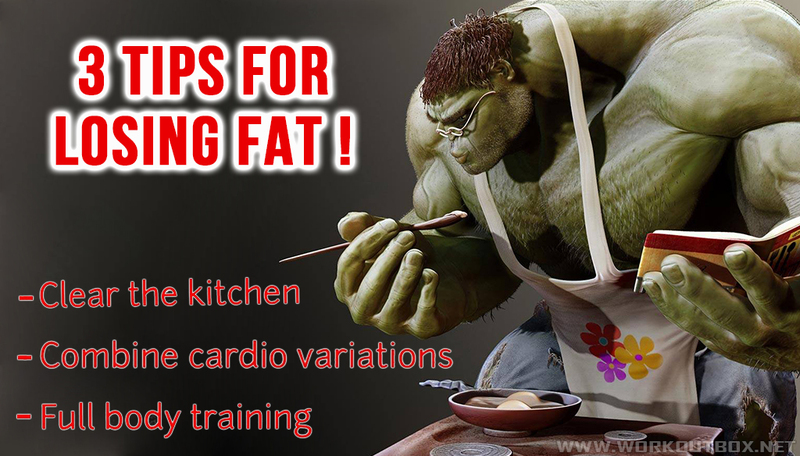 TIP 2: COMBINE CARDIO VARIATIONS The debate rages: steady-state cardio training vs. interval training for fat loss. Steady state allows for a longer fat-burning session. Interval training ramps up your metabolic rate and increases fat oxidation rates for hours after the workout is done. “STEADY STATE ALLOWS FOR A LONGER FAT-BURNING SESSION. INTERVAL TRAINING RAMPS UP YOUR METABOLIC RATE AND INCREASES FAT OXIDATION RATES FOR HOURS AFTER THE WORKOUT IS DONE.” Which to choose? Try both. You might do five or so intervals first and then move into steady-state training. This will allow you to reap all the benefits in one workout. Your cardio, like your weight training, should always be progressively more challenging. “This is the single most important factor in any training program: You will not be successful if today’s training does not exceed yesterday’s in some manner,”.